From devastating natural disasters like wildfires, hurricanes and winter storms to intentional assaults like workplace or school shootings and terror attacks, emergency management and homeland security professionals are needed now more than ever. For those seeking to attain a degree in emergency management and homeland security, career opportunities exist at the local, state, and federal levels. In addition, private sector organizations now understand the value of having an emergency management and homeland security professional on staff. According to FEMA, a single event can take years to recover from, and unfortunately, businesses that do not have an emergency plan in place before a problem occurs may struggle to reopen at all. By bringing an Emergency Management and Homeland Security professional onboard, businesses can ensure continuity of operations, continue to service their customers and maintain the safety of their employees and facilities. If you are interested in pursuing this rewarding career, you’ll be working to secure our country by keeping our communities safe from the various threats and hazards we face. If you have the ability to stay cool in the face of an emergency and a have strong sense of service, these attributes will help you succeed in this challenging but rewarding field. Why Focus on Emergency Management and Homeland Security? When you earn a degree in Emergency Management and Homeland Security, you’ll be able to work for both private organizations and government agencies at the local, state, or federal levels. The growing threats our country faces necessitate the need for emergency management and homeland security professionals. In the private sector, business disruption and injury due to an attack or a natural disaster just can’t be overlooked — and more and more businesses see these positions as an essential role. A focus on higher education could give you an edge when you apply for a job or promotion in this field. Start with a bachelor’s degree in Emergency Management and Homeland Security. According to Program Chair David Jannetty, the preparation you receive in this program will allow you to apply for a variety of local, state, and federal agencies, including local and state law enforcement, the Federal Bureau of Investigation (FBI), Border Patrol, and the Federal Emergency Management Agency (FEMA). The diverse range of topics covered means you’ll also be able to successfully work for private employers and organizations. The ability to think a few steps ahead, a strategic approach to planning and a cool head in a crisis will all help you succeed in this field. If you have military, law enforcement, emergency medical services or other related experience, you can apply your practical background to your new career, as well. What Will You Learn During Your Education? According to Jannetty, one of the goals of the Post University Emergency Management and Homeland Security program is to provide you with a set of skills that will allow you to thrive in this challenging but rewarding field. While many graduates go on to enter law enforcement and government agencies, the skills taught in the emergency management and homeland security program can be applied to positions in other fields, too. Graduates in this field work to create safe and secure communities and workplaces, providing an essential service to our country. What Kinds of Projects Can You Expect to Work On? 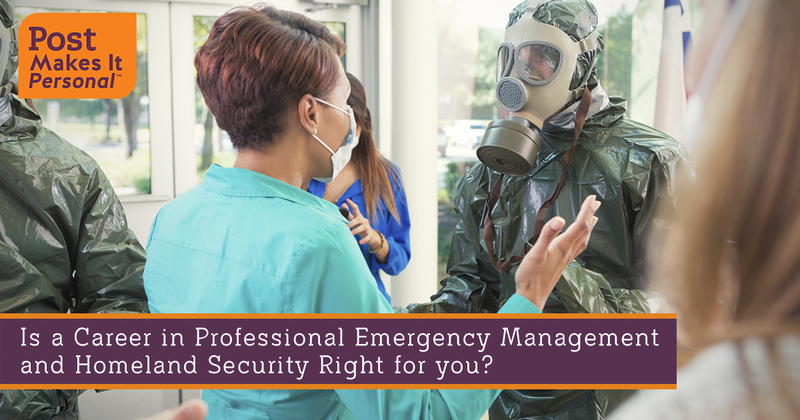 While you’ll learn important skills like report writing and critical decision making, the emphasis on emergency response and planning will also expose you to the best practices available in the field. As the field is constantly evolving and changing, the projects you’ll take on will challenge you, helping you learn the skills to adapt to the latest threats and hazards. From properly assessing risk to creating comprehensive plans for emergencies and disasters, you’ll gain practical experience that will serve you well as your career progresses. What Can Post University Offer for Emergency Management Graduates? The Emergency Management and Homeland Security program is part of Post University’s John P. Burke School of Public Service and Education. Post University has gathered a team of experts with real life, hands-on experience and years of history teaching and working in their fields. By incorporating instructors who have real experience and who are keenly aware of the latest trends, Post University provides an in-depth and well-rounded approach that will help you succeed in your career. Graduates from the Bachelor of Science in Emergency Management and Homeland Security program could elect to move on to graduate studies in the Master of Public Administration (MPA) program. The MPA program offers a concentration in Emergency Management and Homeland Security, offering undergraduates a unique opportunity to continue their studies at the graduate level. Online programming makes it easy for those who are already working in law enforcement or emergency management to fulfill their goals without sacrificing work or home life. By offering an integrated and versatile program that suits the needs of both the full-time and the working student, Post University ensures you can move forward and reach your goals without interrupting other areas of your life.